Most people aren’t aware of just how important those strange looking wall outlets in our kitchens and bathrooms are, you know, the ones with the little buttons that say Test and Reset. They’re known as GFCI outlets, that is Ground Fault Circuit Interrupters, and given the right set of circumstances they could save your life. The GFCI equipped wall outlet, like a mighty robot, continuously watches the flow of electrons (electrical current) passing through, always on the lookout for incongruities between the hot and neutral wires, and ready to jump into action when necessary. Say, for example, that one of these GFCI equipped outlets has an appliance plugged into it. While the appliance is in safe use there is nothing for the GFCI robot to do. It simply takes note of the balance of electrons flowing between the hot and neutral conductors, notes that they are equal, and continues to watch for inequalities. Figure 1 – While the Hand Mixer is Operating Normally, in the GFCI Outlet the Electric Current Flowing in the Hot and Neutral Wires is Equal. The Robot Takes No Action. But suppose that there is a problem with the appliance, something that causes a ground fault where the user’s body provides an unintended path to errant electrons flowing from the hot side of the wall outlet. Those errant electrons are supposed to traverse the neutral wire back through the wall outlet from whence they came, but they have become unruly. Not to worry, if you are up to code and have an ever vigilant GFCI on that outlet, the robot will immediately notice the anomaly. 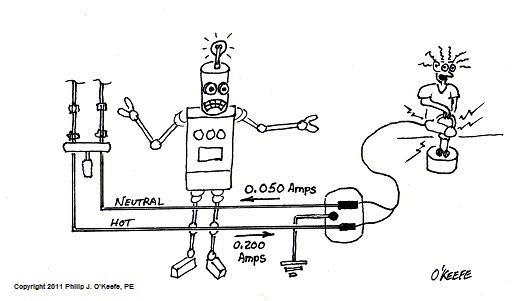 Figure 2 – If a Ground Fault Develops in the Hand Mixer and Some Electric Current Flows Through the User’s Body, Then the Robot Notices a Difference In Current Flowing Through the Hot and Neutral Wires in the GFCI Outlet. 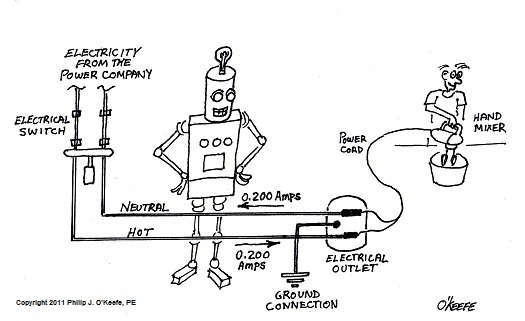 The Mighty Robot of the GFCI doesn’t like the fact that the electrons are out of balance, that there are more of them flowing through the hot wire than returning through the outlet via the neutral wire, so within a fraction of a second it will jump into action to correct things. It hits a lever on a spring loaded mechanism that snaps open an electrical switch connecting the appliance to the hot and neutral sides of the outlet, effectively cutting off the flow of electrons to the appliance. Cut off from power, the appliance ceases to function, but more importantly, the flow of electrons through the user’s body has been stopped before their body incurs injury, or death. 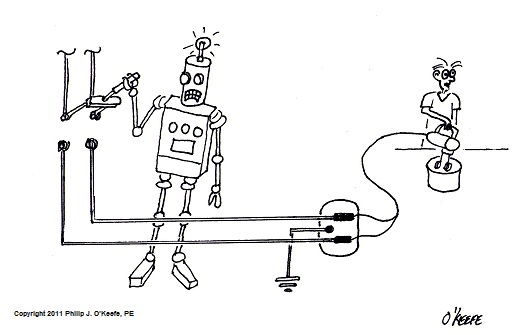 Figure 3- In Response to the Ground Fault, the Robot Opens a Switch in the GFCI Outlet to Cut Off The Flow of Electricity to the Hand Mixer. The Person Operating the Hand Mixer is Saved. The GFCI robot, having done its job, now goes into a sleep mode. It will be reactivated, ready again for its vigilant watch of errant electrons, when the faulty appliance is unplugged and the Reset button is pressed. This button does what it says, it resets the spring loaded mechanism in the wall outlet, closing the electrical switch, and making the outlet functional again. The GFCI robot immediately goes back into active monitoring mode. Now it should be noted that as dependable as GFCI outlets are, they can become defective. That’s why they have a Test button. This button should be pressed periodically to see if the robot is still on the job. If all is in order, the Reset button pops out of the outlet, and anything plugged into that outlet will not operate. When you press the Reset button back in, everything should operate again if there are no fault conditions. That’s it for GFCI outlets. Next time we’ll take a look at how an invention developed to defend the allies during World War II later morphed into a space age device that cooks our food.